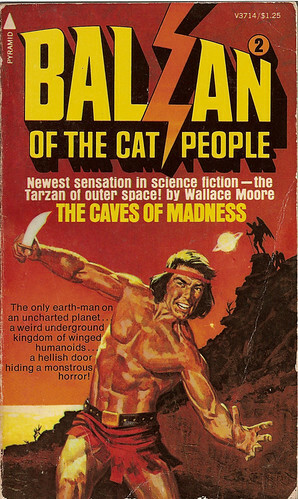 Speaking of marginal mid-70s sword and planet, our pal Dannus has some fierce competition from the likes of Balzan of the Cat People, by “Wallace Moore” (really comics writer Gerry Conway, the writer who killed off Spider-Man’s first girlfriend, Gwen Stacy). As you might imagine, Balzan is a Tarzan clone (ahem, “homage”) on a different planet a la John Carter of Mars. I’ve heard that DAW got into trouble with the first printing of Charles Saunders’s IMARO because they called the character “the Black Tarzan” on the cover, which triggered a response from the Edgar Rice Burroughs estate that forced DAW to pulp the cover and reprint it without the Tarzan reference. Apparently the Burroughs estate was asleep at the wheel six years earlier when Pyramid declared Balzan “The Tarzan of Outer Space!” One wonders if the problematic word on the Imaro cover might not have been “Tarzan” at all. Either way, I am a sucker for the trashy composition and unironic adventure hero on the cover of this one, and I’m eager to give it a read. It’ll be a while, however, as I’m fairly committed to reading my remaining sword and planet novels in chronological order, which means it’ll be a long, long time before I get to 1975. One final note. Despite the fact that this book was written by Gerry Conway, the copyright belongs to someone named Lyle Kenyon Engel, whose name appears numerous times on the legal pages of low-end paperbacks in my collection. The most obvious examples are the Baroness books (The Ecstasy Connection, Diamonds are for Dying, and Death is a Ruby Light), but I know there are plenty of others. I suspect Engel was a book packager, but it’s interesting that he retained the copyright on all of his material. It’s also interesting that almost all of that material consists of gimmick characters that are basically copies of other characters or existing tried-and-true formulas like Tarzan or John Carter or Modesty Blaise or what have you. This site suggests that Engel was the “paperback monger” who put together (you guessed it!) the famous Bicentennial Series of books by John Jakes, which we’ve discussed at length in recent weeks. He’s also apparently the mind (?) behind the “Richard Blade” interplanetary adventure paperbacks that I have thus far managed to avoid buying, based largely upon the overpowering sense of cheapness that emanates from them like Gamma radiation. That definitely fits the Lyle Kenyon Engel format, so at least the guy remained true to his cause. I’ll keep an eye out for more Lyle Kenyon Engel books in my collection. There are a lot of them. I’m afraid everything I know about this cover is listed in the above entry. I too would be interested to discover the artist. Have you tried contacting Gerry Conway? I’ll bet he’s the best source of info on this thing. Cool painting! How’d you come across it?